Henry Ford once brought a French metallurgist to Detroit, part of his plan to build cars with lighter, stronger steel. Vanadium, which the French used in their automobiles, offered him the chance to make the Model T lighter and stronger, and its part in the car’s alloyed steel gave the Model T the longevity which followed it through one of the longest production runs in history. Now battery researchers are looking at another quality of this mineral, its ability to form a superior cathode for batteries that “could supply both high energy density and significant power density. 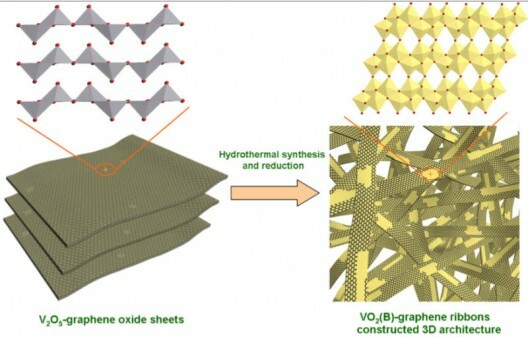 Combined with graphene, the wonder material du jour, vanadium oxide (VO2) could couple longevity echoing the Model T’s with charge and discharge rapidity similar to a supercapacitors. Materials scientist Pulickel Ajayan at Rice University created ribbons of vanadium oxide (VO2) thousands of times thinner than a sheet of paper, and combined those with atom-thick ribbons of graphene to form cathodes which were built into half-cells for testing. These “could be fully charged and discharged in 20 seconds and retained more than 90 percent of their initial capacity after more than 1,000 cycles,” according to the University. Made from relatively abundant and inexpensive materials, the ribbons are made using a “simple hydrothermal process” that could be scaled for greater output. Ajayan overcame the slow charging and discharging of batteries made with vanadium pentoxide by baking the high-conductivity graphene lattice into the vanadium ribbons. This three-dimensional form serves “as a speedy conduit for electrons and channels for ions.” The three-dimensional construct and lattice-like formation suggest a structure similar to that of Amy Prieto’s battery at Colorado State University, which uses a 3-D foam to accelerate the rate of lithium transfer. Co-authors of the new paper are Rice graduate students Daniel Hashim and Lulu Ma; research scientist Zheng Liu; former Rice visiting researcher Liang Zhan, now an associate professor at East China University of Science and Technology in Shanghai; and faculty fellow Robert Vajtai. Ajayan is the Benjamin M. and Mary Greenwood Anderson Professor in Engineering and a professor of mechanical engineering and materials science, chemistry, and chemical and biomolecular engineering. The work was funded by the U.S. Army Research Office and the Office of Naval Research through a Multidisciplinary University Research Initiative grant and a National Science Foundation Graduate Research Fellowship grant. Read the abstract at the Nano Letters web site.